Movies, plus lots of outtakes from A&C MEET FRANKENSTEIN. Rare stuff! 4 DVD Box set. CLICK IMAGE FOR DETAILS. The 1952 Christmas Special featuring the great Abbott and Costello. Originally presented on The Colgate Comedy Hour. A wonderful holiday showcase with Bud and Lou. Plus, bonus Christmas Seal messags from many stars! Two classic Vincent Price chillers: THE ABOMINABLE DR. PHIBES (1971) and SCREAM AND SCREAM AGAIN (1970/also with Peter Cushing). Only a few left. Classic serial with hero Drummond encountering the evil menace known as "The Dragon." Stars John King and Jean Rogers with Lon Chaney Jr. as a criminal. I love the music theme used over the credts of every chapter! A collection of rare outer space short films, trailers, atomic age cartoons and space toy TV commercials. An amazing collection of clips, and featurettes that kids of the 1960s space age grew up with. Crazy sci-fi and real life projected science. Loads of fun! The great serial with Tom Tyler as Captain Marvel facing odds with the nefarious Scorpion. Masked madmen, dusty tombs and non-stop action. 12 chapters. Considered by many as the best cliffhanger serial ever! The great serial with Tom Tyler as Captain Marvel facing odds with the nefarious Scorpion. Masked madmen, dusty tombs and non-stop action. 12 chapters. The greatest serial of all-time! Commentary by Tom Weaver and Leonard Maltin. Fu Manchu will get you! CLICK IMAGE FOR DETAILS. The voices of Basil Rathbone and Bing Crosby. Disney animation at its height with two tales the comprise a full feature. "The Wind in the Willows" features the madcap "Toad" at his manic best. "The Legend of Sleepy Hollow" is the schoolmaster's meeting with the "Headless Horseman." Starring: Don "Red" Barry, Noah Beery Sr. This classic 12-chapter cliffhanger, produced by Republic Pictures, finally comes to Home Video! Bonus Features: The Original Pilot for a TV Series, Original Theatrical Trailer, Lobby Card and Poster Photo Gallery, Biographies, and more! Basil Rathbone faces George Zucco! CLICK IMAGE FOR DETAILS. Three classic episodes from the 1954-1955 Sherlock Holmes television program. Stars Ronald Howard as Holmes. Episodes: Case of Harry Crocker, Case of Cunningham Heritage and Case of Lady Beryl. Approximately 75 minutes. Complete Serial on 2 DVDs. CLICK IMAGE FOR DETAILS. Stars Tom Brown, Rose Hobart, Edgar Barrier, Keye Luke and Sidney Toler. Flying ace "Smilin" Jack Martin discovers an ancient secret passage into China. This mountain gorge is needed by the Allies in World War II. Smilin' Jack is the just the man to make it happen. A 13 chapter cliffhanger. Up, Up and Away! After school memories. CLICK IMAGE FOR DETAILS. THe Man of Steel on DVD. CLICK IMAGE FOR DETAILS. It's the American way....retro TV lives! CLICK IMAGE FOR DETAILS. George Reeves was The Man of Steel for our generation. CLICK IMAGE FOR DETAILS. Three films of adventures, high-flying thrills, and excitement: AIR MANIACS (1933), FLYING HIGH (1929, with Universal Studios stock players), and THE SKYWAYMEN (1928). Plus, trailer previews of air serials. Hitch Triple Feature! CLICK IMAGE FOR DETAILS. The classic TV show....hours of chills. CLICK IMAGE FOR DETAILS. Gooood evennnning....it's classic Hitchcock. CLICK IMAGE FOR DETAILS. Dim the lights and get out the meat clever for cutting edge classic TV. CLICK IMAGE FOR DETAILS. The classic thriller TV series hosted by Hitch himself. This is the entire season 4. CLICK IMAGE FOR DETAILS. Click image for details on this DVD Set. Triple Terror Feature from the master. Multiple disc set of Hitchcock's early British films: THE LADY VANISHES, THE 39 STEPS, SECRET AGENT, JAMAICA INN, THE LODGER, SABOTAGE, NUMBER SEVENTEEN, THE MAN WHO KNEW TOO MUCH and more. These British films made by Hitch all have great performances, along with brooding suspense and shadows. Two Alfred Hitchcock eary thrillers made in England. Includes introduction by Tony Curtis and the Hitchcock trailer for REAR WINDOW. Four Hitchcock thrillers! CLICK IMAGE FOR DETAILS. Hitch is back with four macabre features. CLICK IMAGE FOR DETAILS. Daphne du Maurier's twisted murder tale directed by Alfred Hitchcock. A young woman goes on holiday to the Jamaica Inn only to discover an underworld of evil operating there. Stars the flamboyant Charles Laughton and Maureen O'Hara. Herbert Marshall stars as an actor who believe the testimony of an accused woman. Alfred Hitchcock directs. Introduction by Tony Curtis. Trailer from Hitchcock's film ROPE. Alfred Hitchcock, seat-of-the-pants thriller. A man observes a jewel theft, then is pursued for his life by the villians. Incredible chase scenes! Includes introdution by Tony Curtis and the trailer for Hitchcock's I CONFESS. The early Britch Hitchcock thriller RICH AND STRANGE and the classic Alfred Hitchcock Presents episide THE SORCERER'S APPRENTICE. Introduction by Tony Curtis and trailer for PSYCHO. Double feature of two classic Britsh Hitchcock films: SABOTAGE (1936) and THE LODGE (1927). Introduction by Tony Curtis and the Hitchcock trailer for FOREIGN CORRESPONDENT. Count 'em...20 Hitchcock features on this set! CLICK IMAGE FOR DETAILS. Feuding families in an English village leads to dark crimes. Vintage Hitchcock. Introduction by Tony Curtis. Trailer for DIAL "M" FOR MURDER. Two obscure and fascinating versions of the Lewis Carroll classic fantasy. The 1915 version was filmed on Long Island, NY and stars Viola Savoy and Elmo Lincoln. The sound 1931 version, also included here stars Ruth Gilbert and Leslie King. Fantasic film history. A bizarre movie that has been locked away for years. It features a huge list of stars in this re-telling of the classic story. It comes off, unbeliebly strange, almost nightmarish in sequences! An amazing, amazing oddity. A bizarre European version of the classic fantasy with creepy stop-motion puppets mixed with live action. It was filmed in 1949 and not released until 1951 in the US where it was squashed by the release of the Disney version. Some very odd humor and unsettling scenes that might scare kids. Double Feature DVD...aliens and werewolves! CLICK IMAGE FOR DETAILS. Four movie creature feature! CLICK IMAGE FOR DETAILS. Cleveburg Productions reveal what really happened at Monster Bash Convention in 2010! See Bert I. Gordon, Billy Gray, Ann Robinson, the actual Thing From Another World, underground Martians and "Uncle Ira" save the planet as he fights against Aliens From Outer Space! Also know as GODZILLA'S REVENGE! Indeed. CLICK IMAGE FOR DETAILS. Out-of-Print, but still a few in stock. A woman(Beverly Garland)searches for her runaway husband at a creepy old southern mansion in swampland. A mansion where weird experiments turn humans into alligators that walk on two legs. Lon Chaney Jr.! Turhan Bey is gonna put the whammy on you! CLICK IMAGE FOR DETAILS. Creepy scenes of ghost-like apparitions and Turhan Bey too! CLICK IMAGE FOR DETAILS. He's Invisible! CLICK IMAGE FOR DETAILS. Invisble Madmen and Nasty Disembodied Heads! CLICK IMAGE FOR DETAILS. An extensive documentary on Amicus Films, the company that rivaled Hammer in the 1960s and 1970s. Utilizing Hammer production crews ad actors Peter Cushing and Christopher Lee. Interviews and great information. Extras include two Peter Cushing intimate interviews. DVD set with Peter Cushing and all your favorite British horror stars! Includes the feature films: ASYLUM (1972), AND NOW THE SCREAMING STARTS (1972) and THE BEAST MUST DIE (1972). Click image for more details. Hammer-like Amicus horror with Peter Cushing! CLICK IMAGE FOR DETAILS. Wonderful fantasy with Claude Rains. CLICK IMAGE FOR DETAILS. Movie magic with Claude Rains. CLICK IMAGE FOR DETAILS. Stars Willis O'Brien dinosaurs. A humorous documentary on the animal life of our planet from the beginnings. The highlight is a large segment on dinosaurs from KING KONG animator, Willis O'Brien and Ray Harryhausen. Gertie the Dinosaur! CLICK IMAGE FOR DETAILS. Bela Lugosi as an ape-man! CLICK IMAGE FOR DETAILS. Double Bela Trouble! CLICK IMAGE FOR DETAILS. Boris Karloff, spinal fluid, and a gorilla...a combination waiting to go wrong. CLICK IMAGE FOR DETAILS. A gorilla's terrorizing the countryside! CLICK IMAGE FOR DETAILS. Funny, hairy business. CLICK IMAGE FOR DETAILS. Stars Alan Ladd, Phyllis Calvert, Paul Stewart, and Jack Webb. A postal investigator happens onto a murder. The trail leads him to a run-down hotel and a group of gritty, ruthless killers. A great Film Noir filled with nail-biting mystery and terror. A count (Christopher Lee) has an adventurer risk all in a magical land and free the count's soul that is imprisoned in a mirror. Little does the young man suspect the evil intentions of the count, who can summon the powers of darkness. The cast also features Peter Cushing and Mickey Rooney. Detectives and madman! CLICK IMAGE FOR DETAILS. Gothic horror at its heights in this Hammer Horror like feature film from 1972. A scientist tries to capture the ancient god of death through experimental photographic equipment and gain immortality. Horrific cult classic. Both standard and extended versions. HD remastered with extras. Atomic space age fun! CLICK IMAGE FOR DETAILS. A She Demon from Outer Space! CLICK IMAGE FOR DETAILS. Double woman trouble. CLICK IMAGE FOR DETAILS. Grindhouse double feature. CLICK IMAGE FOR DETAILS. Stars John Carradine and Tura Santana. Carradine is the staple mad doctor bringing corpses back to life creating Astro Zombies....the worst kind! Yeech. It's low-budget James Bond meets low-budget horror. Directed by Ted V. Mikels. Extras: Audio commentary by Mikels, Rifftrack, trailer, more. Another terrifyimg Amicus horror anthology! CLICK IMAGE FOR DETAILS. The people of Atlantis are under the spell of an evil warlord. The warlord has the people mining a rare element that can power heat rays, which he plans to use in his conquest of the entire earth. George Pal special effects. Stars Mark Forrest. Directed by Roger Corman. Atlas leads a massive battle for the tyrant ruler Praximedas. Realizes his mistake....all heck breaks loose! Stars Gordon Mitchell. Just like in SNOW WHITE - there's an evil queen giving people headaches. This jealous queen is kidnapping people from a neighboring village for human sacrifices. Her security system includes a man-eating cyclops in her castle. Big guys throw trees at monsters. CLICK HERE FOR DETAILS. Gruesome looking Italian vampire is on the loose! CLICK IMAGE FOR DETAILS. School public service films from the past that now are quite surreal! CLICK IMAGE FOR DETAILS. 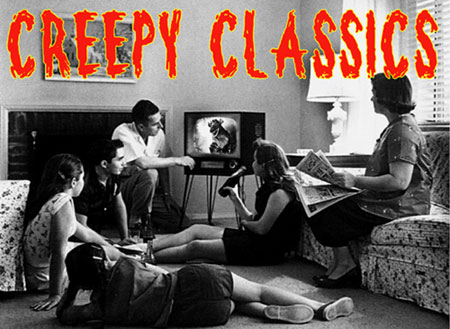 Bizarre health class movies from the past...sure to have you aghast! CLICK IMAGE FOR DETAILS. Scary stuff....really. CLICK IMAGE FOR DETAILS. More crazy old health class films. Crazy man, crazy. CLICK IMAGE FOR MORE DETAILS. Get ready to "duck and cover!" CLICK IMAGE FOR DETAILS. High school class films from the 1950s! CLICK HERE FOR DETAILS. Monster with the brain of a cat! Really. CLICK IMAGE FOR DETAILS. Also known as: MONSTROSITY. An older woman wants a new body and farms out work to the local mad scientist. Young girls are located and experimented on. One somehow ends up with a cat brain. Crazed dementia. Stars Gene Barry, Lydia Clarke, Michael Moore, Lee Aaker and Nancy Gates. A young boy (Lee Aaker) is kidnapped and his Daddy-O is a nuclear physicist with the secrets to the H-Bomb! Great, tense thriller from the 50's, when the general public was just learning the power of nuclear arms. Starman fights monsters to save our world! CLICK IMAGE FOR DETAILS. Evil geniuses, monsters, and hero Starman! CLICK IMAGE FOR DETAILS. One mad 50 foot woman on the rampage! CLICK IMAGE FOR DETAILS. Roger Corman Classics Triple Feature: The original NOT OF THIS EARTH (1957), ATTACK OF THE CRAB MONSTERS (1957), and WAR OF THE SATALLITES 1957). For details, click image! Leeches....leeches...BIG leeches! CLICK IMAGE FOR DETAILS. Drop into B-Movie purgatory! It's a set of DVDs with: PHANTOM FROM 10,000 LEAGUES, THE GIANT LEECHES, GIANT GILA MONSTER, KILLER SHREWS, TEENAGERS FROM OUTER SPACE, WASP WOMAN, BRAIN THAT WOULDN'T DIE, EEGAH!, NIGHT FRIGHT and INVASION OF THE BEE GIRLS! Gamera monster fest of king-size monsters! CLICK IMAGE FOR DETAILS. Creature Double Feature! CLICK IMAGE FOR DETAILS. Ten rockin', fun monster movies in a box set. A tribute to Roger Corman styled 1950s sci-fi films by young director Joshua Kennedy back when he was just 16 years old. An amazing feet for someone at that age. A feature film on a big scale with giant monsters. Unplug for crazy fun. Stars John Agar. Bert I. Gordon's answer to THE INCREDIBLE SHRINKING MAN! A whole batch of shrunken people about the size of G.I. Joe's and Barbie's. Mad puppet maker (Hoyt) shrinks his victims and keeps them in nice plastic cylanders. Adapted from the works of Edgar Allan Poe, this D.W. Griffith film features some of the most nightmarish insane-dream sequences. CLICK IMAGE FOR DETAILS. AVENGING CONSCIENCE (1914) Liberally adapted from the works of Edgar Allen Poe, this D.W. Griffith film features some of the most nightmarish insane-dream sequences. Murder and madness is the mix. THE RAVEN (1915) Strange and mesmerizing film, made when Poe was only a generation gone. Spanish horror with a blind wide-eyed zombie/servant who bites the necks of victims. A doctor tries to restore his daughter's fire-scarred face with skin grafts from beautiful, unconsenting young ladies. Creepy stuff. In French or English with optional subtitles. Lots of bonus material. Dr. Almada disturbs the rest of the Aztec Mummy by removing armor from its tomb. Now the mummy's curse is upon him and his fiancee. The mummy is one cool looking mummy...a shock-haired, teeth-baring, parched-skinned horror. In Spanish language, no subtitles.